Pastors who attended the annual Orders and Fellowship clergy meetings explored how to develop, maintain and grow a culture of call throughout the Great Plains Conference. The two-day event Feb. 17-18 at St. Mark’s United Methodist Church in Lincoln, Nebraska, featured leadership, education and discipleship (LEaD) talks from seven pastors and one lay person from throughout Kansas and Nebraska, lively worship settings and two teaching moments and one sermon by Bishop Janice Riggle Huie of the Texas Conference. The Texas bishop asked those in the St. Mark’s sanctuary to share their call stories with those seated next to them. Videos shown throughout the gathering included a variety of pastors in the Great Plains Conference telling their call stories, from those who knew they wanted to go into the ministry when they were in school to those who made it their second, third or even fourth careers. 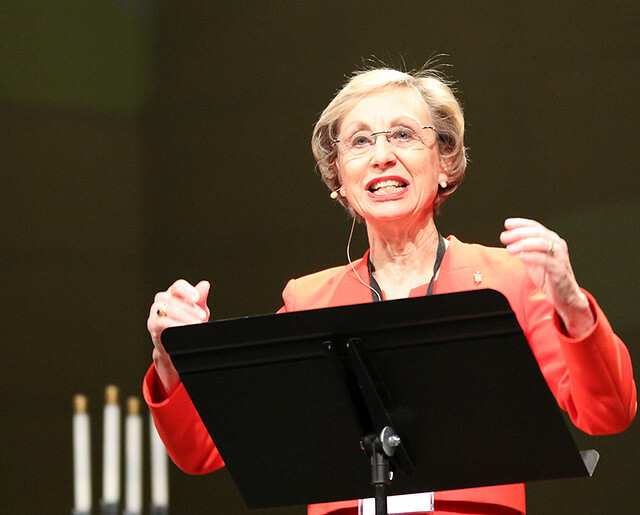 Nurturing the next generation of clergy in the United Methodist Church, Huie said, is one of the denomination’s biggest challenges. Fewer than 7 percent of Methodist clergy are younger than 35, she said, compared to 15 percent in the 1980s. In the second of her three addresses to the clergy, Huie said clergy leadership should develop an “Ecosystem of Excellence,” organic and relational in context, rather than an organizational flow chart. “It’s a complex set of relationships ... among living resources,” Huie said. Ecology, she said, can be healthy or unhealthy, fruitful or unfruitful, sustainable or unsustainable. Young clergy in her conference a few years ago, Huie said, were so rare that they were referred to as spotted owls – with a mascot in a giant owl costume even roaming the floor of the annual conference meeting. Like scientists studying an ecosystem, Huie said, clergy and churches can keep young ministerial prospects from becoming extinct by observing, questioning and experimenting. “We have had experiments that have worked, and we have had experiments that have been abysmal failures,” Huie said. One detriment in attracting young clergy, she said, has become the debt load that they take on during their seminary training. She encouraged churches and established clergy to think of ways to alleviate the financial burden, from fundraisers to a program where pastors “paid it forward” to a new generation after already receiving financial assistance. Orders & Fellowship began with a worship service that included a sermon by the Rev. Wendy Mohler-Seib from Fellowship at the Well in Wichita. Mohler-Seib said her call story was full of “buts” – talking herself out of a possible path to the ministry because she was a woman, too young or not raised as a United Methodist. A panel on campus ministry told what was being done at some of the 15 campuses in the Great Plains Conference. “Campus ministry is really a ripe culture,” said the Rev. Justin Jamis of the Kansas State-Wesley campus ministry program. Mentoring was the subject of a discussion led by the Rev. Ashlee Alley, clergy recruitment and development coordinator for the conference, and the Rev. Mitch Todd, from the Mulvane United Methodist Church near Wichita. “We think that mentoring is an essential feature in cultivating a culture of call,” Alley said. Todd said the ideal relationship between a “mentee” and mentor is 80/20, with the majority of the learning, asking and seeking done by the initiate, and the remainder by the established pastor. In the Great Plains Conference, 299 local pastors are in the training phases of a mentorship – 175 established pastors and 124 going through ordination – with 54 clergy serving as mentors. Bishop Scott J. Jones said that all of the more than 1,000 churches in the Great Plains Conference all have pastors, while other denominations struggle for months and sometimes years to fill pulpits. Contact David Burke, communications coordinator with the Great Plains Conference, at dburke@greatplainsumc.org.